About us. 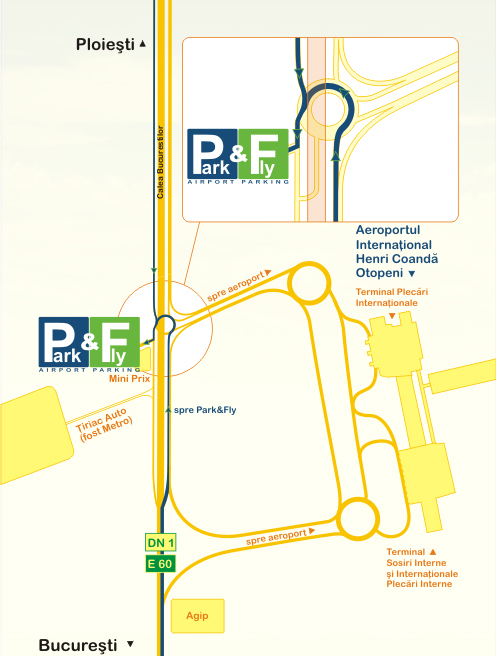 Otopeni Airport and Baneasa Airport Parking. Park & Fly long term parking services. Otopeni Airport and Baneasa Airport Parking. Park & Fly long term parking services. Park & Fly offers long term parking services in the proximity of the „Henri Coanda” - Otopeni International Airport. The project of this business has started from the necessity to satisfy the needs of the air travel customers departing from the Otopeni International Airport, who needed professional long term parking services and had no real choices. It is a known fact that each plane trip, no matter if the purpose is business travel, tourism for week-end or vacation, implies the problem of easy and cheap transport and access to the airport for the passengers from either Bucharest or the rest of the country. The most convenient and efficient way to reach the airport is to come with the personal car, but what do we do with our car while we are away? How can we be sure that we the parking is not very costly and that our car is in a safe place? The solution is the long term parking service offered by Park & Fly. Flexible fares, differentiated according to the parking duration. The parking lot is situated on DN1 road, on the left side on the way from Bucharest to Ploiesti, across the road from Otopeni International Airport, in the roundabout under the bridge, next to the Mini Prix shop (please click on the map to see the exact location).